Any bit of water, especially in the heart of a city is a place where there are no cars, which absorb noise, which contain life. They are stress reducers. So when people dump in them or next to them, not only is it bad for the water and the wildlife, it’s stressful to look at. It’s a slap in the face to anyone who just wants to enjoy that peace and quiet. My father would pick up rubbish whenever he walked the roads around our farm. This drilled into me the idea that you can quietly take on responsibility for something that technically you don’t have to do but it is the right thing to do. And then over time I’ve become aware of the amount of rubbish in the ocean when I read about the Great Pacific Garbage Patch. So much of the stuff in the ocean and on the beaches it is consumer items, not barrels of nuclear waste dumped by Bad Guys. It’s toothbrushes and Cidona bottles dumped by us. This is us. It’s on us. It’s easy to get disillusioned because rubbish just keeps being dumped but everything you pick up or help prevent being dropped is one more thing that doesn’t end up in a turtle’s gullet. 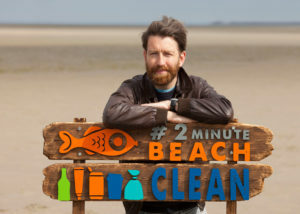 I first heard about it because I was asked to come up with a video for it but I realised it was part of something I was already involved in – picking up litter along the canal near where I live so I figure, all water leads to the coast so why not start there and work back!